Time to Move From Fear and Towards Love, in beautiful Colorado, again! You are invited to join Melisa Pearce and Anna Twinney for this FREE WEBINAR on moving away from fear and towards love . . . through horses. The Webinar format allows for live interaction and discussion with Q&A throughout. Melisa and Anna met through their participation as contributing authors in the book Horse as Teacher, a Path to Authenticity. Discovering the commonality in their interpretation of horses and humans, they have begun to work more closely together and today collaborate on several projects. During this webinar, Melisa and Anna will discuss and share how horses interpret our fear, their natural response and how they lead humans away from it when understood. Melisa will share about her experiences with horse’s claire-sentient abilities that she sees everyday as she partners with horses who emotionally heal humans through her Equine Gestalt Coaching Method® process. Anna will be sharing her experiences as a Natural horse trainer who has traveled the world working with and studying horses behavior. She will share how they are affected in ways you may not even be aware of when you are working with them and what you can watch for with your horse. As we remember from the Course of Miracles, the opposite of love is fear..so how do we move toward love through our horses and how do we move toward love and away from fear while working with our horses? The webinar is FREE and ALL are welcome. Feel free to share the number & link with your friends! The webinar is presented via your computer and you will be able to listen to it over your computer speakers. You have the option to call in on the phone number that is included in the reminder email that you will get the day of the webinar. During this workshop, Melisa and Anna will teach you how horses interpret our fear, their natural response and how they lead humans away from it when understood. Melisa will share about her experiences with horse’s claire-sentient abilities that she sees everyday as she partners with horses who emotionally heal humans through her Equine Gestalt® process. Anna will be sharing as a Natural horse trainer who has traveled the world working with and studying horse’s behavior. She will share how they are effected in ways you may not even be aware of when you are working with them and what you can watch for with your horse.
. . . the opposite of love is fear. . . so how do we move toward love through our horses and how do we move toward love and away from fear while working with our horses? This is a hands-on experiential workshop, combing Anna’s natural training techniques and Melisa’s Equine Gestalt Coaching Method®. Through training methods and animal communication you will explore your connection to these powerful animals and deepen your connection to yourself. This is your last chance to work with these two very gifted ladies in 2013. This is the third year for Anna and I to combine forces and provide this workshop. Back by popular demand, we have brought it back to Colorado and it is one of my favorites all year. You will learn a great deal about horses and maybe even more about yourself through working with them. No one knows all there is to know about our equine partners and the same holds true for personal insight. 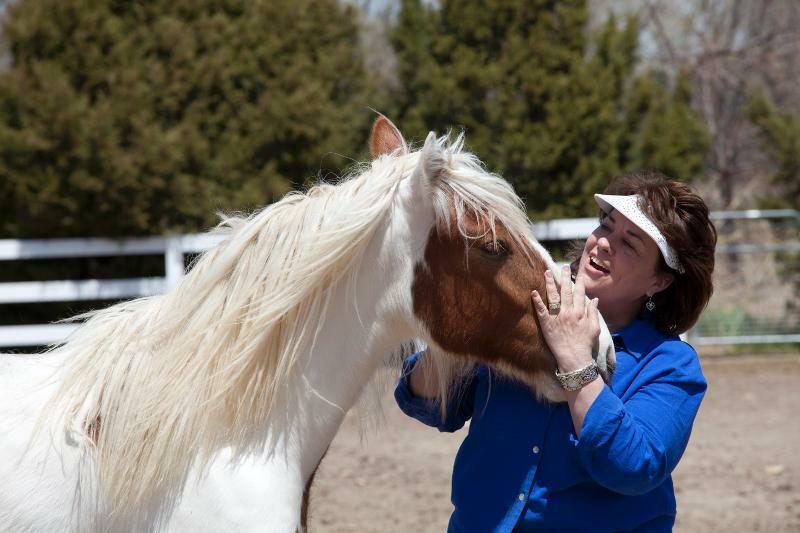 Horsewoman, Coach, Author, Animal Communicator. . .
coaching and psychotherapy practice. Melisa was named one of the TOP 50 Horsewomen in the US. Melisa specializes in bringing forth and empowering inner qualities of her clients through their connection to the horse. She created the Equine Gestalt Coaching Method® Certification Program with student enrollment from all over the United States, Canada and Internationally. Melisa teaches through being with the horse, how to better understand yourself. Her methods of using your intuition, and intention as well as the somatic vibrational fields are all part of the tools she uses when working with horses. Melisa’s unique Gestalt process and methods bring graceful breakthroughs from old patterns to new life affirming habits and awareness. This event will take place at Lil Bit North Ranch in Longmont, CO. You will want to fly into the Denver airport, which is about an hour from the ranch. Allow enough time to be ready at our start time. Detailed information is provided after registration.